Forget Me Not Shelter Blog » Formal Wear February – special on fancy dress kitties! « Today’s featured cat: ICICLE! Formal Wear February – special on fancy dress kitties! Ah, February – a month to honor Love and Commitment! Why not celebrate February by adopting a loving kitty that will always be Dressed to Impress?! All black and black/white cats’ adoption fees through 2/28/13 are priced by the “pound of loving” they provide… from our $9, 9-pound petite beauties Calandra and CaraCara, all the way up to our $17, 17-pound stunning Bluebird, minimum adoption fees are LOW LOW LOW for these special cats. PS – OK, Bruno is still “No Fee” but he is special, too. Thanks to Shelter Manager Tiffany for the February inspiration! 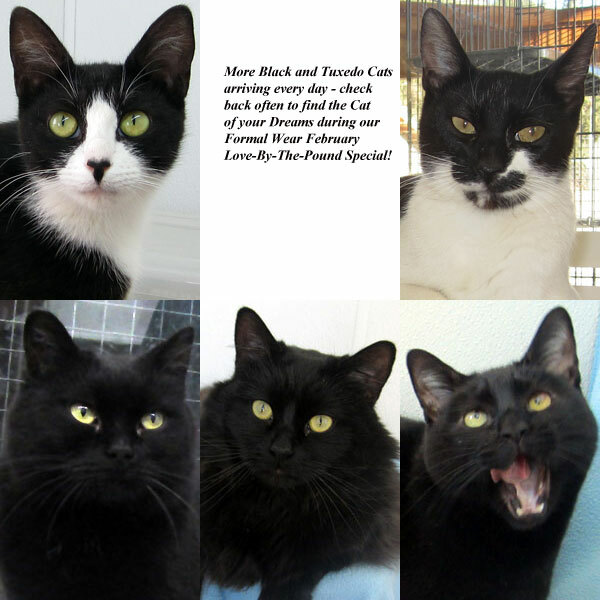 Photo shows only a handful of the eligible black and tuxedo kitties at the shelter right now – more will be added soon!